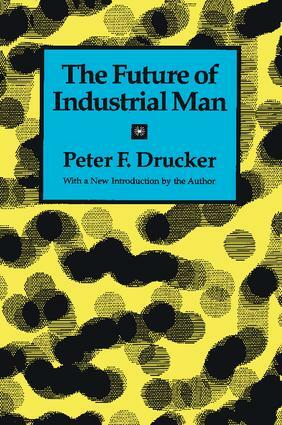 The Future of Industrial Man is the only book by Peter Drucker in which he systematically develops a basic social theory. He presents the requirements for any society to be functioning and legitimate, and then applies these general concepts to the special case of the industrial society. In his new introduction, Drucker explains that his reference to mercantilism in The Future of Industrial Man can today be called neoconservatism, which, he asserts, denies rather than affirms the reality of industrial and postindustrial society. Drucker outlines the major shifts of previous centuries. He describes the move from an agrarian to an industrial economy, illustrates the structure and dynamics of this new industrial order, and warns of the abuses inherent in the system if attempts are made to maintain it under anachronistic social conventions. He emphasizes the fact that the new industrial order must operate under a "legitimate" system of po-litical power supported by social authority. He discusses the particular roles of the owners, the workers, the managers—the corporation itself—as he pinpoints the problem that he considers the most central and the most critical: how to maintain the continuing freedom of the individual in an increasingly intricate, bureaucratized world. What Is A Functioning Society?